Hey pizza lovers, let’s celebrate summer in the best way possible—pizza and wine! 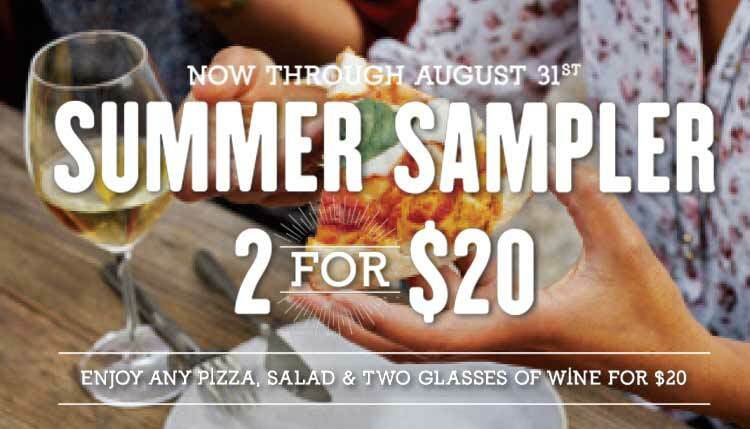 Join us from now until August 31st and try our Summer Sampler. With your choice of 1 pizza, 1 salad, and 2 glasses of wine—you and pizza fans everywhere will enjoy every last bite for only $20. Also, for a limited time only, we have a seasonal salad that will set the mood for summer: Watermelon & Arugula Salad. This seasonal salad is packed full with fresh seedless watermelon, spinach, arugula, jicama, roasted pumpkin seeds, feta cheese and dressed with white balsamic vinaigrette. Add this salad to your Summer Sampler for a perfect summer treat.